The SKB SB-1000 0.5mm ballpoint pen was featured on Cool Tools last week, but I missed it when it was originally posted. It wasn't long after that post that a reader asked me about the pen and if I had tried one. I of course hadn't at the time, but I did email SKB and they were nice enough to send me some pens to review at no charge. Thanks Mariah! The SKB ballpoint does have a bit of a following in the art world, and is actually referred to as the "James Jean pen" by many (see samples of Jean's artwork right here). My first impression of the pen was that it is a glorified Bic Stic, but that would be selling the SKB very short. While the barrel is nothing special - standard clear plastic barrel with a bit of taper in the grip area - the performance of the tip and ink are very nice. If there is such a thing as a needle tip ballpoint, this is about as close I have seen. Does anyone remember the old extra fine PaperMate ballpoints? I used them back in the 80's, but after some quick Googling, I don't see that they are manufactured anymore. They were likely 0.5mm and came to a needle type tip, at least in comparison to a standard ballpoint. The SKB does a much better job with tip design. When the pen hits the page, this pen really stands out. It lays down a smooth, skip-free line, with a nice, dark black ink, which isn't always easy to find in a ballpoint. Be sure to see the large writing sample to see how cleanly it writes. While this pen isn't going to replace the Uni-Ball Jetstream, Zerbra Surari or Pilot Acroball in my arsenal (mainly because of the nicer barrel options), I do find that it writes better than pens like the Zebra Technoline. For the price ($11 per dozen), it provides a great bang for the buck, and is a very enjoyable pen to use. Big thanks to SKB Pens for sending me these pens, and for throwing in plenty of extras for me to share with readers of The Pen Addict. You can find SKB pens on the web at www.skbpens.com, and they also have a Twitter account @skbpens, although there isn't much action there yet. 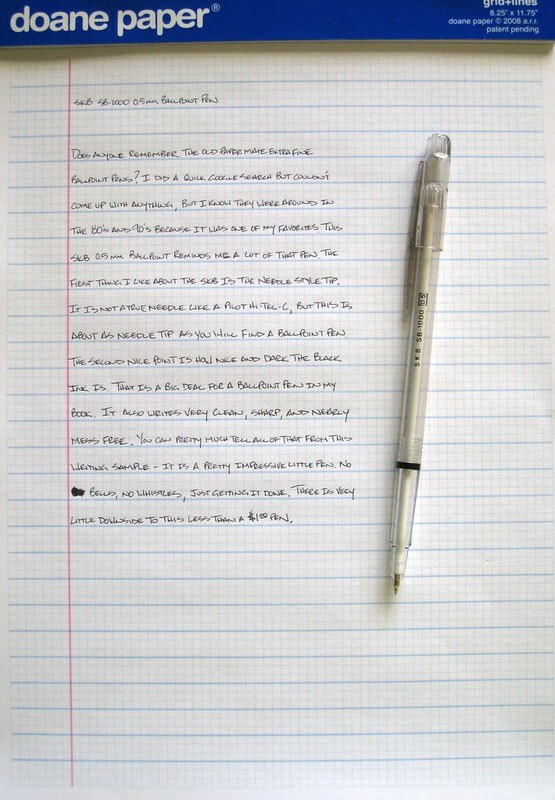 Posted on July 26, 2010 by Brad Dowdy and filed under Ballpoint, Pen Reviews, SKB.